Wear your Michele Urban watch in the city, small town, metropolitan or rural area! Wherever you go, so can this barrel-shaped beauty, that comes in three sizes Classic, Mini and Coquette. Each exudes a retro glamour. All have Swiss movement, sapphire crystal and are water resistant to 50 meters. They are available in stainless steel, yellow gold and rose gold plated, and two-tone finishes. Be sure to check out the Michele Urban watches with Guilloche dial. In black and white. How many people can say their watch has a subtle architectural pattern? 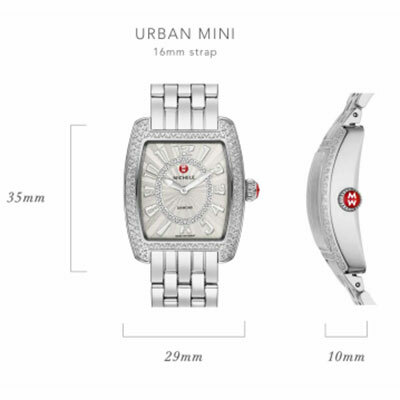 Interchangeable bracelets and straps for the bold and elegant Urban measure 20mm Personalize your Urban Mini with 16mm. And your Urban Coquette cocktail watch with 12mm of leather, metal or exotic skin. 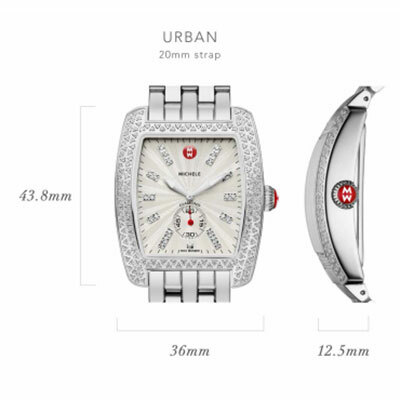 It is quick and easy to give your Michele Urban watch a makeover! Order today and take one out on the town tomorrow!